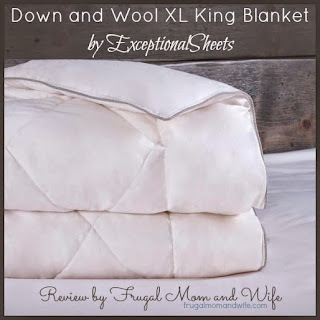 Frugal Mom and Wife: Down and Wool XL King Blanket by ExceptionalSheets Review! 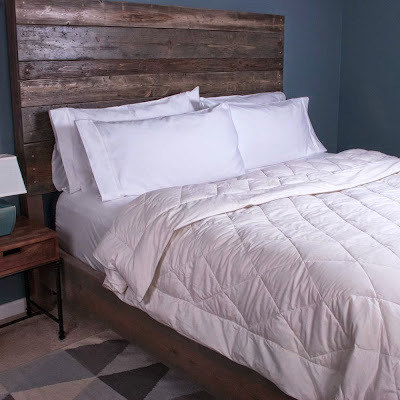 Down and Wool XL King Blanket by ExceptionalSheets Review! When it comes to scorching heat, Texas is one of the many states that gets it fair share. This heat finds you where ever you are and makes life harder than it needs to be. The A/C is constantly running in my home and even though it may be over 100 degrees outside, inside it's ice cold to make up for it. When we sleep at night our body heat naturally rises and to keep cool thin blankets or none at all is the key. That won't work for me, I need to be covered. The problem with many summer time blankets is that they are way too breathable. Meaning air wisps through it like an air filter. Honestly that seems to be to me a glorified throw and not a blanket at all. Finally, the perfect weight summer blanket offering the luxury of down with the cooling properties of Wool. It all starts with a 300 thread count unbleached cotton fabric finished with a silky hand we lightly fill it with our blend of down & Wool. The Wool and down is blended in an equal ratio to offer the benefits of fluffy down with cooling wool. The result is a light weight summer blanket perfect for those who get warm easily and don't want a down alternative (polyester). The sewn through construction is complimented with a 6 inch border for a sharp looking master suite. The most beneficial feature I have noticed with this wonderful blanket is that it traps both heat and cool air. It doesn't allow air to seep through when your fan, A/C or heater is blowing directly onto the blanket. This is very rare to find in most blankets due to the quality, design or materials used in making, especially down blankets and comforters. There are all kinds of sizes, colors and quality downs to choose from but not all are worth your money. Trust me I have been through quite a few in my lifetime so far and most have let me be unimpressed. Leaving me wondering what is the point of the luxury design if you cannot receive the luxury feel. That is not the case with this down blanket by ExceptionalSheets. At night I like my family to stay cool with air and warm with their blanket but with an equal balance. The fibers in this wool blanket allow this to happen with outstanding pleasure. Cool when you need it and warm when you don't. As a blanket should this one provides everything your looking for in a quality down. Hands down you can Dream Naturally with the super size of this blanket easily. Both parties can burrito themselves and still have blanket left over. I like to swaddle myself quite often so this is perfect. Allows my husband to still get his fair share of the blanket while I am wrapped in my cloud blanket. When yous not using this wonderful blanket it can even be easily store in it's zipper case and stored for later use. When it comes to a high quality down blanket that cannot be beat go with ExceptionalSheets, you will glad you did. LOL I need to be covered at night too! I'm glad you found the perfect summer blanket and knowing that it's been tested in Texas, I know it's good! They look so beautiful and luxurious. I just want to nestle in there and take a nap. This looks so comfortable! I feel like I could have a good night's rest in this cover set. I still do like a cover on in the summer, so this is a perfect answer.